myCountyMarket :: Save Money. Save Time. So you want to be a coupon shopper! Great! One of the questions I get a lot about coupon shopping is, "How long does it take?" A lot of that answer depends on how fast you learn, and how much time you actually have to dedicate to coupons. You can start with a hour a week, or go full in and spend five hours a week looking for deals. My suggestion is to keep it simple and get faster as you learn the tips. Many new couponers spend a lot of time clipping coupons they will never use. All that time adds up to dirty dishes, unfolded laundry, and TV shows missed! You can streamline the time spent sorting and cutting pretty easily. You don't have to clip coupons you will not be using! On Tuesday mornings, I find 15 minutes to check the weekly sale a day early. This extra day allows me to order any special coupons I want for the week. It also allows me to print coupons before everyone else looks at their store lists. I go to My County Market Weekly Sales. It is posted by 9am on Tuesdays. Step 2: I print coupons off all my favorite cheap and easy sites. These include Coupons.com PrairieFarms.com Bettycrocker.com Campbells.com Kelloggs.com These are the standard sites with the most coupons. Step 4: Get your phone or laptop out and "Clip" all the digital offers from County Market. It's free, and you will have them clipped and ready even if you change your mind about buying those items in store. If in doubt, just clip it! It's free and doesn't make a mess. Step 5: I start looking at Hot Coupon World database for any coupons I may have missed. I type in any food item I want a coupon for and see if it's listed in newspaper coupons. ***This is a time saver: If it lists a newspaper insert coupon, look at the date of issue, then pull the insert out of your insert pile and cut it. Don't cut every coupon all the time. Just when you need it. no more spending an hour a week cutting coupons you will never use. Step 6: While looking at the inserts, if there is an item I want go ahead and cut it. I know I'll use it before expiration. If in doubt, leave it in the pile. You can always go back and search by date for the coupon you want and clip it later. Step 7: Put these coupons with my Penny Pinchers organized by layout of the store. 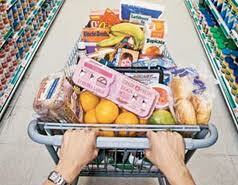 In My store: Produce, branded Meat, condiments, canned veg, ethnic foods, baking, cereal, cleaning, dairy, breads, frozen. Pretty simple. These steps will help you to not get caught up in the time trap. Don't clip what you won't use. Don't have 200 extra coupons in hand while shopping, and Don't worry about missing 1 coupon. Grab the main deals each week and be happy saving dollars and not pennies.